Leicester Square, the heart of London's West End, used to be one of the most fashionable places to live in the 17th and 18th centuries. It was home to many notable people of that period, such as Sir Isaac Newton and William Hogarth. In the late 18th century it became an area for entertainment and gradually became less fashionable. Nowadays the pedestrian area of Leicester Square has many different forms of entertainment throughout the day and night. By day buskers amuse the crowds of tourists, theatres and cinemas are open with plenty of performances to watch and enjoy and cartoonists drawing caricatures of tourists. At night there are long queues for popular night clubs, Equinox, Hippodrome and Maximus. 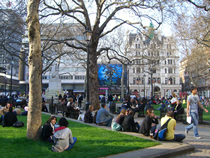 The centrepiece of Leicester Square is a small park area containing Shakespeare's fountain, surrounded by dolphins. Four busts have been placed at each corner of the park of some of Leicester Square's famous original inhabitants, Isaac Newton, Joshua Reynolds, William Hogarth and John Hunter. There is also a statue of the actor and director, Charlie Chaplin at the edge of the park.